Narwhal and Jelly . . . and Otty?! Exuberant Narwhal and skeptical Jelly test the waters of adding a new friend to their pod when they meet Otty the super-adventurous otter in the fourth book of this blockbuster early graphic novel series! Dive into three new stories about the joy of adventure and the power of friendship! 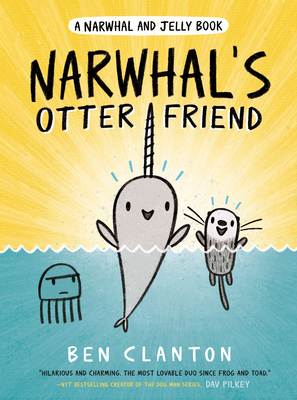 In the first story, Otty the otter makes her debut splash; while Narwhal greets her with immediate enthusiasm, Jelly's not so sure about her...mostly because he worries she'll take his place as Narwhal's best friend. Readers will easily see why Narwhal's so excited to meet Otty, a boisterous explorer who even has an aunt who's a real live sea captain! But readers will also relate to Jelly's uneasiness seeing his best friend making a new pal. Jelly tries to work out his jealousy in story two, and in story three, the new trio say "Ahoy, adventure!" and discover they all have more in common than they thought . . . including a love of waffles! Jelly also takes over the "Super Waffle and Strawberry Sidekick" comic providing a sidekick's-eye-view of defeating the dreaded dEVILed egg! BEN CLANTON is an author and illustrator whose picture books include Mo's Mustache; Rot, the Cutest in the World! ; Boo Who? ; It Came in the Mail; Something Extraordinary; Rex Wrecks It! and Vote for Me! He lives with his wife and son in Tacoma, Washington.